In this authors opinion, the Dreadnaught set is easily the best looking Warrior set ever made. This says not only a lot about the set itself as the number 8 overall in all of Azeroth, but it also speaks volumes for the Warrior class being neglected in many other sets. That said, the Dreadnaught set is simply amazing looking with the gunmetal gray color scheme and huge menacing shoulders with an eerie glow. 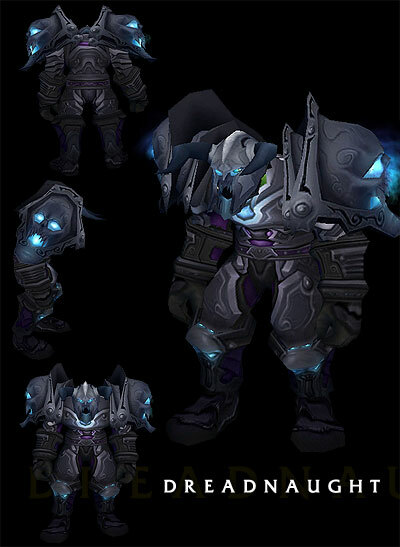 Couple this with the evil looking helm and I am certain that there are many Warriors who would still be wearing or otherwise seeking out this set if Blizzard implements an appearance tab. This entry was posted on July 28, 2011 at 10:23 pm and is filed under General, HFL, Podcast, Raiding, Role Playing, World of Warcraft. You can follow any responses to this entry through the RSS 2.0 feed. You can leave a response, or trackback from your own site.